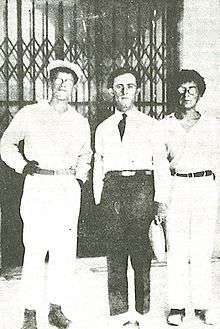 Abba Ahimeir, Uri Zvi Greenberg, and Joshua Yeivin. Brit HaBirionim (Hebrew: ברית הבריונים, The Strongmen Alliance (Alliance of Thugs)) was a clandestine, self-declared fascist faction of the Revisionist Zionist Movement (ZRM) in Palestine, active between 1930 and 1933. It was founded by the trio of Abba Ahimeir, Uri Zvi Greenberg and Dr. Joshua Yeivin. The 1929 Arab riots and the Haganah's inability to successfully prevent the 1929 Hebron massacre and the Safed massacre led to the creation of the first militant organization characterized by its complete disassociation from the existing Zionist establishment dominated by the Labor Zionist movement. The organization's official ideology, was Revisionist Maximalism which was modeled upon Italian Fascism. It sought to create a fascist corporatist state. It is also influenced by the Canaanite ideology of Yonatan Ratosh and the theories of Oswald Spengler in The Decline of the West (1918). It called for the Zionist Revisionist Movement (ZRM) to adopt the fascist principles of the regime of Benito Mussolini in Italy to create an integralist "pure nationalism" amongst Jews. Revisionist Maximalism rejects communism, humanism, internationalism, liberalism, pacifism and socialism; condemned liberal Zionists for only working for middle-class Jews rather than the Jewish nation as a whole. Revisionist Maximalism's minimal goals were presented in 1932 where Ahimeir officially called for the leadership of the Zionist Revisionist Movement to be redesigned into the form of a dictatorship, called for the creation of an independent Zionist federation, called for a "war on funds" to end corruption in the Zionist movement, and called for a war on anti-Semitism. The movement's psychology was emphasized in its motto of "conquer or die". Abba Ahimeir (the man in handcuffs) and other members of Brit HaBirionim, among them Haim Dviri, as being brought before a court of law by law enforcement in Jerusalem. Members of Brit HaBirionim carried out several operations, including demonstrations against visiting British dignitaries, rallies against the British arrest and deportation to Europe of Jewish refugees who overstayed their tourist visas, attempts to interrupt a census conducted by the British, and other illegal activities intended as public provocations such as blowing the Shofar at the Western Wall (forbidden to Jews at that time), and removing the Nazi flags from two German consulates. In 1933, the British Mandatory Authority arrested several members, including Ahimeir, and charged them with the murder of Chaim Arlosoroff. Though acquitted of the charges in 1934, the trial tarnished the group's reputation and led to its isolation by former political supporters among the Jewish populace, and eventually to its demise. ↑ Assaf Sharon,'The Moral Siege,' Boston Review August 05, 2014. 1 2 Shindler, Colin. The Triumph of Military Zionism: Nationalism and the Origins of the Israeli Right. I.B.Tauris, 2006. p13. ↑ Weinberg, Leonard; Ami Pedahzur (2004). Religious fundamentalism and political extremism. Routledge. p. 97. ISBN 978-0-7146-5492-8. ↑ Shindler, Colin. The Triumph of Military Zionism: Nationalism and the Origins of the Israeli Right. I.B.Tauris, 2006. p156. ↑ Larsen, Stein Ugelvik (ed.). Fascism Outside of Europe. New York: Columbia University Press, 2001. ISBN 0-88033-988-8. p378. ↑ Golan, Zev. Free Jerusalem: Heroes, Heroines and Rogues Who Created the State of Israel, (Israel: Devora, 2003), pp. 49-53, 66-77. ↑ "Terrorism Experts". Archived from the original on 2007-12-17. Retrieved 2007-12-02.